I’m a pacifist. So going armed does not come naturally. But for this encounter I needed everything in the armoury. I needed to be fully tooled-up. The secret weapon, the ultimate defence, was primed and was nestling reassuringly in the deep pocket of my trousers. And (just in case), a copy of the Nota Simple (a short, official version of the escritura for my house). Officially not necessary, but some expat websites have recommended taking it. Except that the Policía Nacional at Málaga’s Oficina de Extranjeros has recently been randomly requiring that the form S1 from the UK government must be officially stamped (apostillado) by a notary in the UK. Other people have reported that they have been asked for an official notarised translation. None of this is mentioned on either the Spanish government’s website, nor on the UK government’s web pages for people moving to Spain. It shouldn’t be necessary, as the form S1 is a standardised form across the EU, exactly for the purposes of being accepted anywhere without being stamped or translated. But arguing with the people who have the power to grant or refuse resident status would be a fruitless and counter-productive exercise. Technically, as a resident of Colmenar, I should go to the Policía Nacional at Málaga, where I would risk being turned away or having to go through a long and expensive process of finding a UK notary to stamp my S1. Hmm. If only there was some way of circumventing this …..
Enchufe to the rescue once again! A coffee with a good friend, a phone call is made, and lo and behold I am sent to Torre del Mar comisería where such stamps and translations are not required. Armed with my bundle of papers (and of course my secret weapon) I turn up at the comisería. On entry I am given ticket number 40. The machine is showing that number 19 is currently being served. I go for coffee over the road at the conveniently-placed cafe (they should have a linked electronic display direct from the police station, as so many people are there awaiting their turn!). After coffee and the machine is still only on 25. A young Polish couple are there to register their child, so that he can then be registered with the health service. He is adorable and completely charms the waiting queue and the woman in charge of the extranjeros section. Their application takes longer than it should as it is interspersed with a great deal of gurgling, cuddling, and general diversion. A Spanish man is there to register his French girlfriend. Her Spanish is fluent, her nationality only given away by the use of the French “rrrr” at the back of the throat, rather than the rolled Spanish “rrrr”. I chat with a Columbian woman – like most South Americans her Spanish is clear and easier to understand at speed. We exchange phone numbers and agree to meet for a coffee and an intercambio, as she wants to improve her English. Slowly the numbers click over. Frustratingly, when it reaches 39, a man returns with some photocopies he’d had to go off for, and he is slotted in. While he is finishing his business, a woman returns from the bank with her receipt, and SHE is slotted in. Even more annoyingly, while she is being served, a woman wanders in, looks at the displayed number and tuts. She had number 27 but went to the cafe and missed her turn. So she is slotted in before me too. The cafe over the road does a roaring trade for people waiting for their turn at the comisería. Jaime knows what the different nationalities like for breakfast. It is mostly English people so he does a great line in bacon rolls. The Polish people like something savoury, he says, and those from African countries prefer something sweet. He is patient as customers struggle with their new language, and he repeats everything clearly to help people correct their pronunciation. Unknowingly, Jaime is a small cog in the process all of us immigrants go through to become resident in our new country. Finally it is my turn. Having brought so many papers, of course I needed hardly any of them. 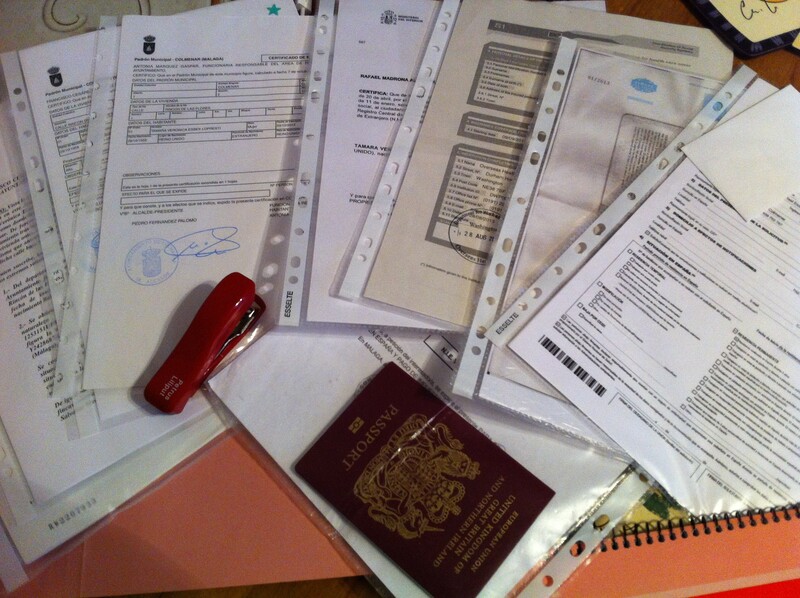 Rosa took my EX-18 application form (and just one of my copies), looked at my NIE, checked my passport and kept the copy I’d brought, took the copy but NOT the original of my S1 health cover document, and took the certificate from the bank showing my average balance over the last three months. I didn’t need the passport photos (as the residents’ card doesn’t have one), and didn’t need the Padrón, the Padrón Historico, the certificate from the town hall about the change of number if my house, nor the escritura / Nota Simple. But of course …… had I not had them, the story may have been different. After everything was approved, I was sent across the road to hand over €10.40 at the bank. Returning with the stamped receipt, I was slotted in (presumably to the annoyance of the people with the next few numbers!) and my little green card was issued to me. I am disproportionately proud of it. Soy extranjera, pero soy residente oficiale. Estoy contenta. At home I shut the door firmly behind me and breathed a sigh of relief. The secret weapon hadn’t been needed. I went through to the study, slipped the stapler (*) out of my pocket and back into the desk drawer. I’m sure that every immigrant in Spain has seen and enjoyed the legendary YouTube video about bureaucracy and funcionarios in a Spanish office. It is brilliant, funny, and at least in part, pretty accurate. It was made for an international film festival where it won an award some years ago, since when it “went viral” and became a standard part of the induction for newbies in Spain. Then, it seems that “the authorities” took exception to its portrayal of Spanish civil servants, and earlier this year it was removed from YouTube and marked as being “Not permitted in the country you are in” (ie Spain). Fortunately someone had made a copy, and it was put up again under a different title. A month later that link too was disabled and marked “Not permitted in the country you are in”. Two days later it re-appeared, again with a different URL. So for those who have still not seen it, here is the (current) link http://www.youtube.com/watch?v=HGhomDQenLg . No doubt shortly this will also be removed. Someone up there is putting a lot of effort into suppressing this innocent little satire. When the day comes that this link doesn’t work, search YouTube using the search terms “funcionarios” and “leyendo” and look for the screen-shot of a young woman with long hair looking determined, or a man at a desk looking defensive. Merece la pena – it’s worth it. Sadly the very final image is clipped slightly short, but the film-makers’ satire using wild west imagery stands (and hopefully will continue to stand) as an iconic summation of the universal experience of dealing with bureaucrats in Spain. And I can never use my stapler again without going for a quick draw ….. 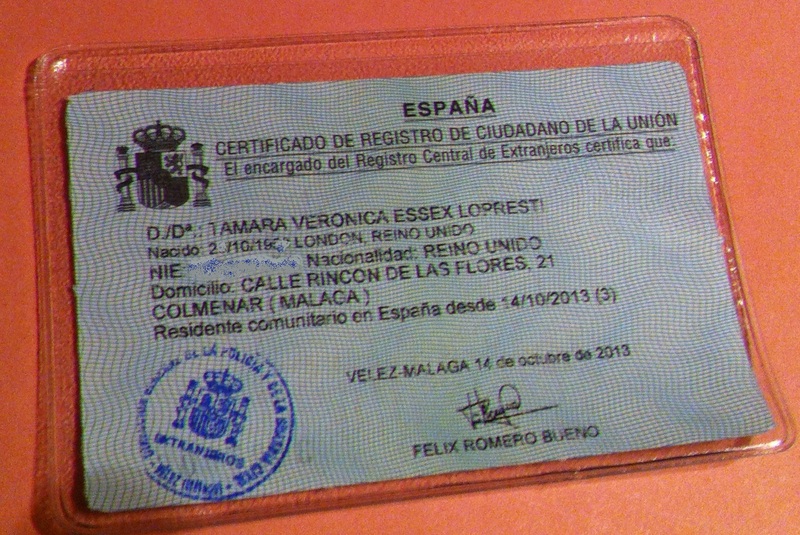 This entry was posted in Spain and tagged Andalucia, Axarquía, Colmenar, funcionarios, Málaga, residencia, Spain, Torre del Mar by tamaraessex. Bookmark the permalink. This should appear on the .gov website because you capture the scenario to a tee! Excellent! Not quick enough on the draw! Your link to the video has already been blocked! Too late for the link! Experienced a first this morning. Have Spanish workmen in this morning, they were due to arrive at 10.00 and came at 9.30! Ah, the trials of expat life in Spain! My American friend was married two years ago and tried to get her permanent residency in Antequera, only to be turned away. All it took was asking the woman at the bar across the street to talk to the funcionarios during their breakfast and coffee hours to get the decision reversed! Hahaha Cat – a different kind of enchufe, eh? I fondly appreciate your refined sense of humor and how you show the most exquiste indulgence with our bureaucracy. 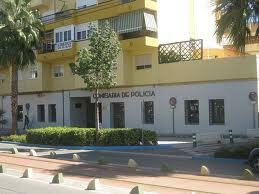 I wish you have a wonderful “residencia oficial”. Thank you Jose – you are my very best teacher (but don’t tell that to Juan-Mi! ).